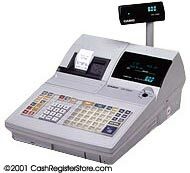 Casio CE-7000SS Electronic Scanning Cash Registers at Cash Register Store. The Casio CE-7000SS is a CE-7000 that has been initialized for scanning. It includes a metrologic laser scanner and (2) 512K RAM chips installed. NEW System upgrades now allow the Casio CE-7000 to scan up to 20,000 PLU's.